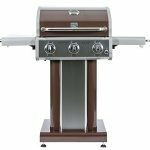 If you are shopping online for a portable gas-fired grill or griddle, then you are spoiled for choice! The increasing popularity has inspired a wide range of manufacturers to flood the market with options, making it hard to sort out one from another. The first choice in the portable category is whether or not you want a grill or a griddle. While there are some that are versatile enough to do both, you usually pay for that extra bell and whistle. The notable advantage of a griddle is that it allows you to do things like made grilled cheese sandwiches, fry bacon, and eggs or make something special like French toast. 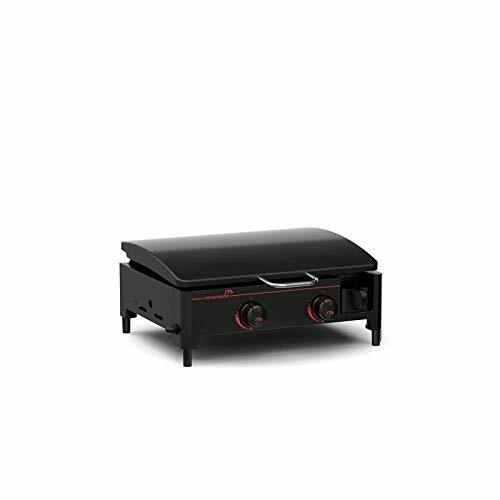 If that sounds like something you are in the market for, then the Megamaster 820-0054D Propane Gas Griddle deserves a good hard look. It has two propane fired stainless steel propane burners that generate 9,000 BTUs of heat each. They are easy to ignite with a push and turn ignition knob. The griddle is made from cast iron that has been treated with five layers of non-stick porcelain. This isn’t something you find with a lot of other portable gas griddles in this price range. Most of those units have cold rolled steel, which needs to have the seasoning layer maintained with every use. Others have Teflon coating over thin steel which is prone to scratching or degrading over time. The non-stick griddle also includes a large port for redirecting excess grease and debris from the surface. It all pours into a large grease cup that can be accessed from the front of the griddle base. This means on the rare occasion when it might get too full during a grilling session, you can easily pull it out to empty it before there’s an overflow. The lid on the Megamaster 820-0054D Propane Gas Griddle serves to protect the griddle surface from ambient dust when its stored. When its folded up it also acts as a wind protector and backsplash. There is very little assembly required with the Megamaster Gas Griddle. The process of unboxing it is half the effort of putting it together. It even comes with a propane hose and dedicated regulator. 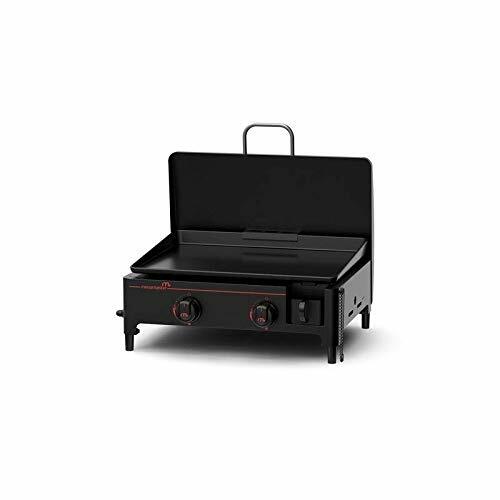 This isn’t necessarily something you find with a lot of other portable grills and griddles in this price point. Most are designed to run on a small one-pound propane tank, and if you want the hose and regulator you need to buy it separately. The porcelain coating on the griddle is rather rare. It has most of the non-stick qualities you like with a Teflon coated or seasoned rolled steel griddle. Yet it is far more durable and easier to maintain in the long term. This griddle can do pretty much anything you want a griddle to do. It’s surprisingly level, which is nice. The last thing you want to do is chase a cracked egg around or try to coax a wave of rendered fat toward the grease management port. Now if you have been debating griddle versus the fire-kissed flavor of a grill, there are a few things to bear in mind. Sure, there are certain things that you can make on a griddle, like a fried egg or a pancake that you just can’t make on a grill. But what about the things you can make on both? Let’s look at this through the lens of the beloved hamburger patty. When you grill it on grates, the natural fat that renders out drops down into the flames. Some of it vaporizes for some added aroma and a slight kiss of flavor. When you put it on a griddle, the rendered fat refracts back infusing the flavor of fat into the meat, while developing a uniform crust. In a blind taste test, you might even find yourself preferring the griddled burger! 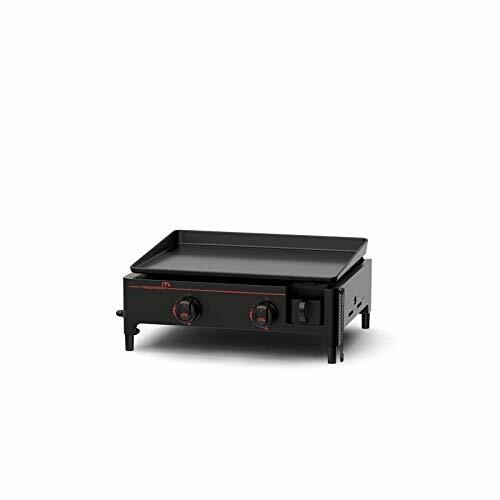 The Megamaster Gas Griddle has a 20-inch firebox with a 282 square inch, porcelain coated griddle. The protective lid might not seem like a special feature at first glance. Yet lingering dust and the odd strand of pet hair floating in the air seem to love an exposed griddle surface, even when it’s stored away in a cabinet. When in use the lid can be used for wind protection as well as acting as a backsplash against spatter. The durable five layers of non-stick porcelain on the griddle top certainly helps with cleanup. Other griddle surfaces can be a headache. Cold rolled steel needs to have the seasoning layer maintained, and a scratch in a Teflon griddle is a glaring mistake that will stare you down with every cooking session. The front grease trap with its large griddle top port, allows you to easily dispose of rendered fat and lingering grease. The Megamaster Gas Griddle comes with a one-year limited warranty. This is pretty much the same level of warranty that you will find with other competitors at this price point. There are also some online retailers who offer affordable three years and four-year protection plans. 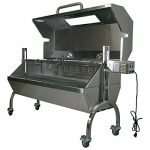 This category of portable grill is rife with competition, to the point where a lot of manufacturers struggle to offer up something that will stand out from the crowd. Megamaster manages to take a step forward with this portable gas griddle. The griddle itself is easy to maintain, the unit is easy to clean, and it stores away conveniently.